Watching Malala Yousafzai’s speech to the UN on the BBC, I became overwhelmed by her incredible passion and bravery. She spoke not for herself, but for others whose voices cannot be heard. She was fighting for the rights of others in hopes of someday living in peace. Her goal was for everyone to be treated with dignity and for all to be educated. And so as I was riveted in my chair listening to Malala; my mind went to how much we take for granted when it comes to education. We are surrounded by good schools and alternative educational opportunities continue to evolve. The latest available statistics show that in the US, 77 million children and adults were enrolled in school – from nursery school to college. There are 98,706 public schools, 33,740 private schools and 4,409 degree granting institutions of higher education. 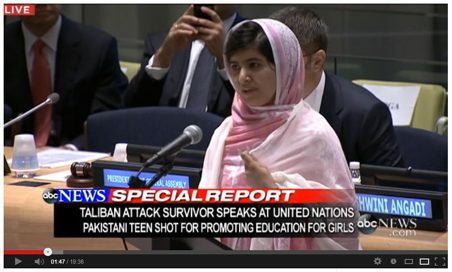 Watch Malala Yousafzai’s speech to the UN 2013. Malala was speaking for education and equality for women and children because that’s where she is experiencing the biggest problems in her country. In our country, one of our educational challenges is making sure that adults have access to learning that will give them the skills and knowledge they need to perform in the opportunities that exist in the workplace today. It only takes a few minutes of a Google search to show you how much the internet has changed the way we can acquire knowledge. Online learning opportunities are increasingly available: breaking barriers of geography, time and affordability. Programs are abundant including high school classes, certificate programs and advanced degrees from Bachelor’s to Doctorates. Massive Open Online Courses (MOOCs) have been made available by some of the most prestigious colleges in the country. Courses for adults are available in all types of business subjects including human resources, leadership, customer service, sales and non-profit management. Many individuals who want to make a career change to healthcare are discovering online, self-paced clinical courses. How wonderful that someone can gain skills, get a better job and improve their economic situation on their own time from the comfort of their home.